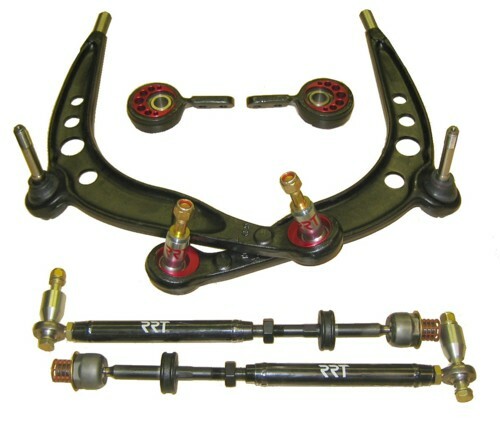 Standard kit includes Race Front Control Arms and Race Tie Rods. Add installed bushings or bearings at additional cost (automatically calculated above). These suspension kits will take your car to the Touring Car level. The control arms feature new outer ball joints that correct camber curves and most importantly, roll centers. The ball joints use an eccentric ball joint race that adds 1/4" of track and 0.5 Deg of camber on each side. In a racing environment the suspension should not flex. RRT also includes control arm carrier bearings to prevent suspension geometry change under braking and cornering. On any lowered car bump steer becomes an issue. Also included in the kit are bump steer adjustable tie rods. With simple spacers you can change the way your car reacts under bump and rebound or just simply adjust until bumpsteer is minimized. These kits are legal for SCCA World Challenge, BMW CCA Mod class, and SCCA GT classes. 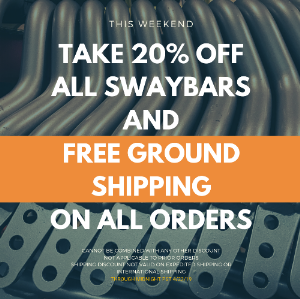 All parts are 100% bolt-on and require no modifications to your vehicle.